Looking for houses with Dormers? Two attractive dormers top this interesting Country Home, providing extra light and interesting inside features for upstairs Bedrooms. Two dormers top this interesting country home. The foyer is opened to the parlor with columns and a low wall which can be eliminated, using a laminated beam. A long screen porch extends dining area. 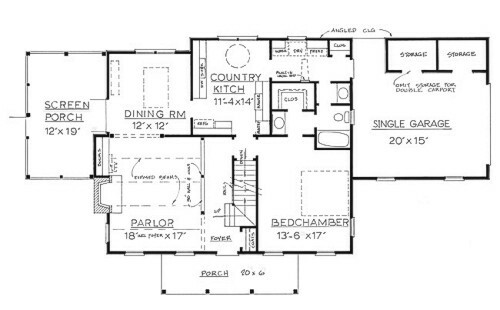 The plan has alternates for two kitchen layouts; one with a window at the kitchen sink and breakfast area. 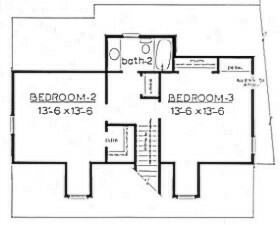 The alternate plan has more square footage, but offers a larger master bath with separate shower and tub. Also, the alternate plan adds 2 feet into the dining room and 2 feet into the two upstairs bedrooms. The single garage can be enlarged to accommodate two cars. 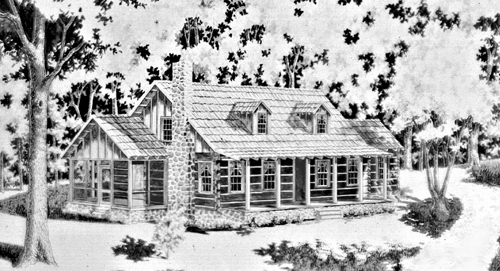 This floor plan is also available with chinked log exterior.